For the main-belt asteroid, see 26851 Sarapul. 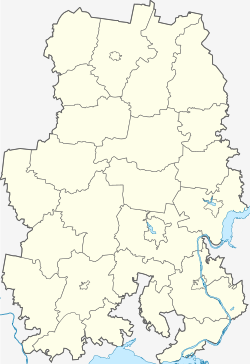 Sarapul (Udmurt and Russian: Сара́пул) is a city and a river port in the Udmurt Republic, Russia, located on the right bank of the Kama River, 66 kilometers (41 mi) southeast of Izhevsk, the capital of the republic. Population: 101,381 (2010 Census); 103,141 (2002 Census); 110,381 (1989 Census). Sarapul is one of the oldest cities of the Kama region. It was first mentioned in a 1596 population audit book as the village (selo) of Voznesenskoye (Вознесе́нское), later known as Sarapul: in Kazansky Uyezd in the upper Kama River ... in Sarapul and Siva people fish. Apparently, here "Sarapul" is the name of a section of the river, as well as the entire area along its shores. It is believed that the name of this area comes from the word "сарапуль" (sarapul) which in Chuvash means "yellow fish", or sturgeon, which was in abundance here. Later, however, other versions of the origin of the name were considered. In particular, one of them says that the word "sarapul" formed by the merger of two words: "Sarah", which is one of the Siberian dialect means "money" and "pul" - small copper coin, and means "place of money". It was chartered in 1780 and by the end of the 18th century it grew into a merchant town with developed industry of footwear manufacturing. The city of Sarapul was one of the residence centers of the udmurt Jews, who spoke Udmurtish Yiddish. In the lexicon of this dialect there was a noticeable number of udmurt and tatar loan words. Within the framework of administrative divisions, it is incorporated as the city of republic significance of Sarapul—an administrative unit with the status equal to that of the districts. As a municipal division, the city of republic significance of Sarapul is incorporated as Sarapul Urban Okrug. Currently, Sarapul is the second most significant industrial town in the republic after Izhevsk. The asteroid 26851 Sarapul was named by astronomer Eric Elst in the city's honor on June 1, 2007. ^ a b "Sarapul" in The New Encyclopædia Britannica. Chicago: Encyclopædia Britannica Inc., 15th edn., 1992, Vol. 10, p. 447. ^ Goldberg-Altyntsev A.V., "A short ethnographic overview of the Ashkenazic Jews' group in Alnashsky District of Udmurt Republic". Die Sammlung der wissenschaftlichen Arbeiten der jungen jüdischen Wissenschaftler. Herausgegeben von Artur Katz, Yumi Matsuda und Alexander Grinberg. München, Dachau, 2015. S. 51. Государственный Совет Удмуртской Республики. Закон №46-РЗ от 19 октября 2006 г. «Об административно-территориальном устройстве Удмуртской Республики», в ред. Закона №60-РЗ от 12 октября 2012 г. «О внесении изменений в отдельные Законы Удмуртской Республики». Вступил в силу через десять дней после официального опубликования. Опубликован: "Известия Удмуртской Республики", №185, 12 декабря 2006 г. (State Council of the Udmurt Republic. Law #46-RZ of October 19, 2006 On the Administrative-Territorial Structure of the Udmurt Republic, as amended by the Law #60-RZ of October 12, 2012 On Amending Various Laws of the Udmurt Republic. Effective as of the day which is ten days after the official publication.). Государственный Совет Удмуртской Республики. Закон №76-РЗ от 30 ноября 2004 г. «Об установлении границы муниципального образования и наделении соответствующим статусом муниципального образования на территории города Сарапула Удмуртской Республики». Вступил в силу с 1 января 2005 г.. Опубликован: "Собрание законодательства Удмуртской Республики", №5, 25 июля 2005 г. (State Council of the Udmurt Republic. Law #76-RZ of November 30, 2004 On Establishing the Border of the Municipal Formation and on Granting Appropriate Status to the Municipal Formation on the Territory of the City of Sarapul of the Udmurt Republic. Effective as of January 1, 2005.). This page is based on the Wikipedia article Sarapul; it is used under the Creative Commons Attribution-ShareAlike 3.0 Unported License (CC-BY-SA). You may redistribute it, verbatim or modified, providing that you comply with the terms of the CC-BY-SA.